Similar to her 2012 documentary, The People of the Kattawapiskak River, which detailed the housing crisis of the Awattapiskak First Nation's people, Alanis Obomsawin's Hi-Ho Mistahey! examines this community with a shrewd political eye, aiming to raise awareness about the lack of resources allotted by the government for education. Her voice, one of sensitivity and political necessity, is a vital part of the Canadian narrative, bringing attention to marginalized people with an eye for detail and community introspection, humanizing a subject that, for those in mainstream culture, is more of a peripheral social grievance than something for active consideration. In 2000, the elementary school in Awattapiskak was shut down after the land was determined toxic. Since then, the students have been schooled in outdoor portables with heating and vermin issues, making it difficult to maintain a dedicated staff and offer the children the same comforts and amenities that children in more centralized regions are afforded. Initially, the government had allotted funds for a new school, but, as noted in Hi-Ho Mistahey!, the budget for education within the Department of Indian Affairs isn't specifically protected and can be utilized for other issues if they're deemed more critical. 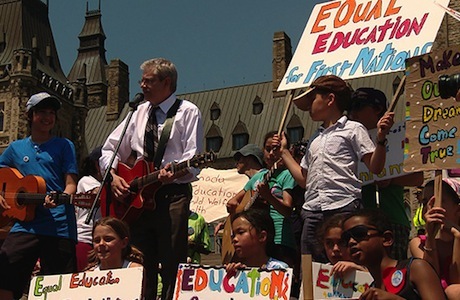 Frustrated with endless financial delays, the community, spearheaded by teen activist Shannen Koostachin, reached out to children across Canada, creating a grass roots awareness campaign throughout the schools, forcing parliament to listen through sheer volume. This story, in itself, is quite inspirational and captivating as a cultural assessment of the ever-changing Canadian landscape. Unfortunately, it's not a particularly complex or involving story, which is why Hi-Ho Mistahey! tends to feel directionless and unfocused. Amidst the core narrative about this movement, which, tragically, was started by someone who couldn't see it through after losing her life in a car accident, Obomsawin inserts several interviews with community members about topics like meat smoking and suicide statistics without specifically relating it back to the central topic. Obviously, the aim is to paint a picture of the community and determine why it's important to keep children there rather than have them go off to the city to study, but it plays more as a series of disjointed sob stories to make saccharine what is already an essential dialogue with enough emotional weight to sustain itself. And since there's little stylization or sense of pacing, it leaves everything feeling bloated and amateurish. Still, Obomsawin's determination to keep the world aware of the social and political issues affecting smaller communities in rural areas is commendable. She's clever enough to acknowledge that these plights stem from a Canadian cultural tendency to deny our less than flattering pass without dwelling on it or tossing out glib or dismissive comments about the urban lifestyle. It's this integrity and determination that helps make a difference.